With the current expansion of Photoshop, it can be difficult to determine if a picture posted online is real or fake. Every year hundreds of photographs become viral on the Internet, and in most cases we have an opinion over their authenticity. This article will examine 20 real pictures that were made famous by the Internet. In most cases, the photos have caused an Internet debate over their origin. All of the images depict real events, but some have false back-stories. I will attempt to clear up the facts surrounding some of our favorite viral photographs. The Mwanza Flat-headed Agama (Agama mwanzae) is a lizard in the family Agamidae. It is found in Tanzania, Rwanda and Kenya. 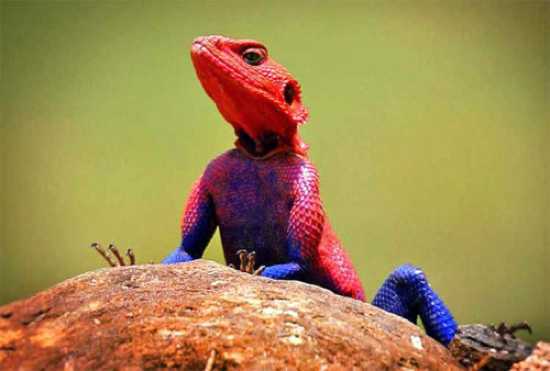 In 2009, a photograph of the lizard went viral after people recognized the similarity to Spider-Man. The male’s head, neck and shoulders are bright red or violet, while the body is dark blue. 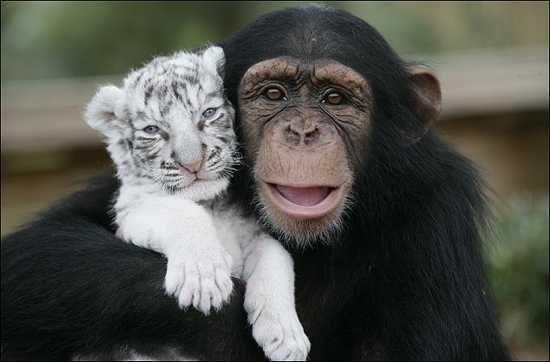 Since the picture became popular, the species has turned into a fashionable pet. A solar eclipse occurs when the Moon passes between the Earth and Sun, thereby totally or partially obscuring the image of the Sun. The solar eclipse of January 15, 2010, was an annular eclipse, meaning the Moon’s diameter appeared smaller than the Sun, causing the Sun to look like an annulus (ring). The event was the longest lasting annular solar eclipse of the millennium, and the longest until December 23, 3043, with a maximum length of 11 minutes, 7.8 seconds. Immediately following the eclipse, a number of photographs of the event went viral. 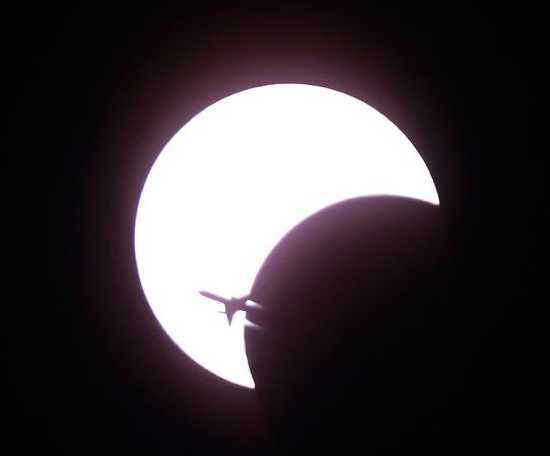 This image was captured in Bangkok, Thailand, and shows an airplane silhouetted against the partial eclipse. 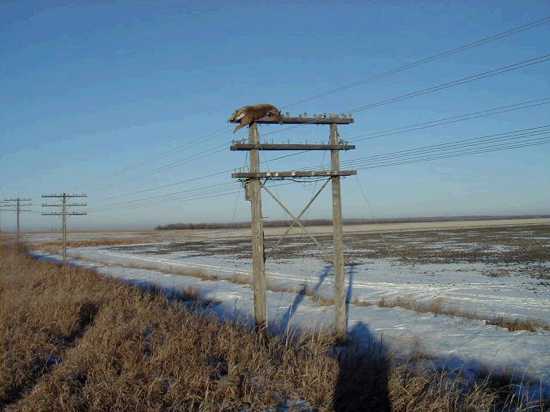 In 2004, a collection of strange pictures surfaced on the Internet of a deer that was discovered atop a 25 foot (7.6 m) tall communications pole. The photos were taken in Headingley, which is a rural municipality in Manitoba, Canada, located directly west of Winnipeg. Several people in the area witnessed the bizarre scene. The local media picked up the story and speculated that the deer was tossed up onto the pole after being struck by a passing train. Others insisted the event was the work of a prankster. Oddly enough, a similar mystery had been previously reported when a deer was found hanging in Delaware County, New York. In 2004, a similar occurrence took place when a moose was hoisted 50 feet (15.2 m) into the air by construction power lines. The event took place on Pogo Mine road, near the Teck Polo gold mine, 80 miles southeast of Fairbanks, Alaska. Officers speculated that the moose got its antlers caught in a half-inch cable, and then was hoisted 50 feet (15.2 m) into the air when the cables were tightened with a hydraulic winch. Sadly, the 1,200 pound moose was still alive when it was lowered to the ground and then euthanized. Here is the pic. The history of the Internet is full of viral images that show giant animals. 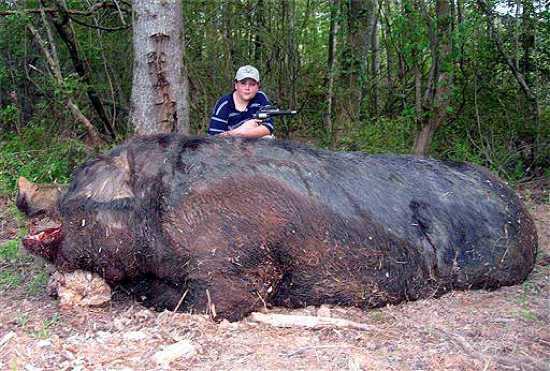 In May of 2007, a large domestic farm-raised pig was shot and killed by an eleven-year-old boy named Jamison Stone. The location of the shooting is claimed to be a 150-acre (60 ha) enclosure within the commercial hunting preserve called Lost Creek Plantation, outside Anniston, Alabama. According to the hunters, the pig weighed 1,051 pounds (477 kg) and was 9 feet 4 inches (2.84 m) in length from the tip of its snout to the base of its tail. Stone said he killed the animal with a Smith & Wesson Model 500 that had a mounted holographic scope and ported barrel. He fired eight 350-grain Hornady cartridges into the pig and chased it for three hours before it collapsed from blood loss. Several days after the story broke, suspicion mounted over the authenticity of the photographic evidence. Retired New York University physicist, Dr. Richard Brandt, used perspective geometry to demonstrate that the boy in the photo was standing several meters behind the pig. However, the Associated Press (AP) continues to keep the monster pig image in their archives with no mention of deception. Some other cases of viral pictures showing giant animals include Hogzilla, the camel spiders in Iraq, the giant catfish, Herman the giant rabbit, the huge eastern diamondback rattlesnakes, and the coconut crab. 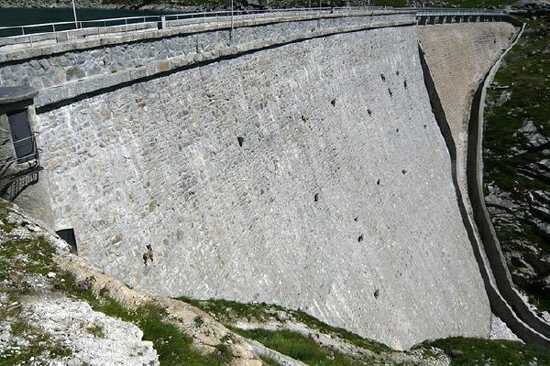 In December of 2006, photographs were taken of a car accident that involved a close encounter with a 200-foot (61 meter) cliff. During the event, a man was driving his 1991 GMC pickup on Highway 59 near Hurricane City, Utah. While on the road, the man’s car slipped, he overcorrected, and plowed through a cement barrier. 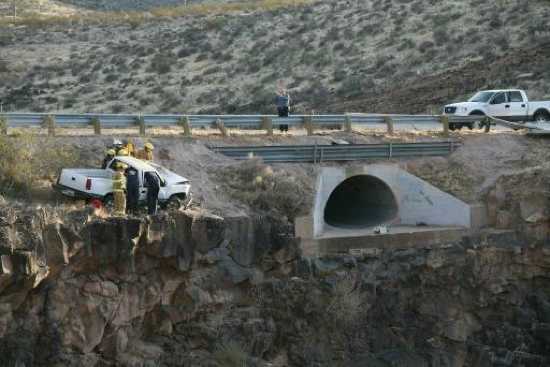 The vehicle left the highway, moved over a drainage culvert, did a complete 180, and landed 12 inches (0.3 m) from a 200-foot (61 meter) cliff. The truck ended up in the opposite direction it was traveling. In 2007, a collection of three photographs showing the scene went viral. In the picture, you can see in the upper right hand corner where the truck left the highway, moved over the drainage culvert, did a 180, and stopped next to the massive cliff. Norbert Rosing is a German wildlife photographer that has been featured in National Geographic magazine. Rosing regularly travels to the western coast of Canada’s Hudson Bay near Churchill, Manitoba, to take pictures of polar bears. In 2006, Rosing captured a collection of photographs of a polar bear playing with a group of sled dogs. He originally thought the bear was going to attack, but was surprised to see it was only curious. 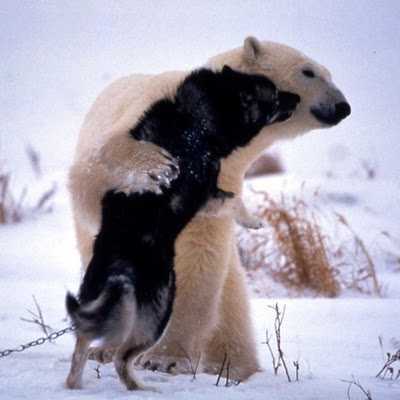 According to Norbert’s account, the polar bear later returned to visit the dogs. Julio Aparicio is one of Spain’s most famous matadors. In 2010, he was performing at the Festival of Saint Isidro, which is considered the most important event in the bullfighting calendar. It is held at the Plaza de Toros las Ventas bullring in Madrid, Spain. During the event, Aparicio was gored in the face by a bull. 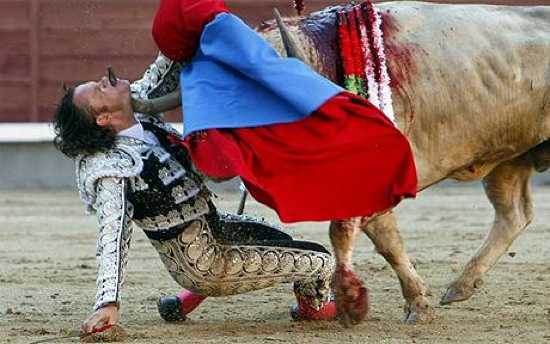 The bull’s horn entered under Aparicio’s chin and came out his mouth. He was seriously injured in the event and had two surgeries in order to escape death. In 2010, the image quickly went viral. In 2001, a collection of photographs began to circulate on the Internet that showed the body of a massive grizzly bear. Along with the pictures, many articles included a detailed story about the bear’s size and appetite for people. Some Internet sites claimed that human remains were found inside the bear after it was killed, but this is not true. In fact, the slain bear was shot in October 2001 by U.S. airman Ted Winnen, who was stationed at Eielson Air Force Base near Fairbanks, Alaska. Winnen encountered the enormous bear when he was deer hunting on Hinchinbrook Island, in Prince William Sound. It was reported that the bear came towards Winnen, so Ted shot it. It is unclear if the bear was startled by the men or if it charged them. Winnen measured the animal at 10.5 feet (3.2 m) from nose to tail. The weight was estimated to be between 1000-1200 pounds. The bear is an extraordinary large specimen for the Prince William Sound area (twice the normal size), but it is not a world record. 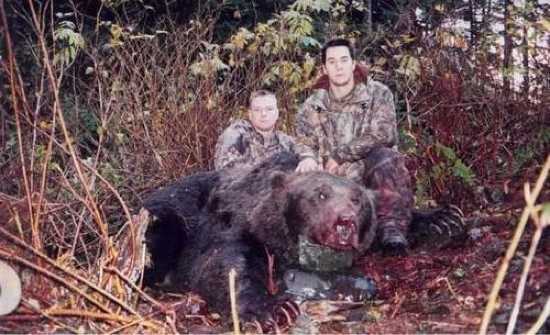 Ted Winnen bagged the bear with a .338-caliber Winchester Magnum. On February 4, 1976, a large earthquake struck 160 km (99.5 miles) northeast of Guatemala City, Guatemala. The area suffered extreme damage and most adobe type houses near Guatemala City were completely destroyed. The earthquake hit during the early morning (3:01 am), which contributed to the high death toll of 23,000 people. In June of 1976, National Geographic magazine published an issue dedicated to the earthquake. One picture in the magazine (captured by Robert W. Madden) shows a plane crash. 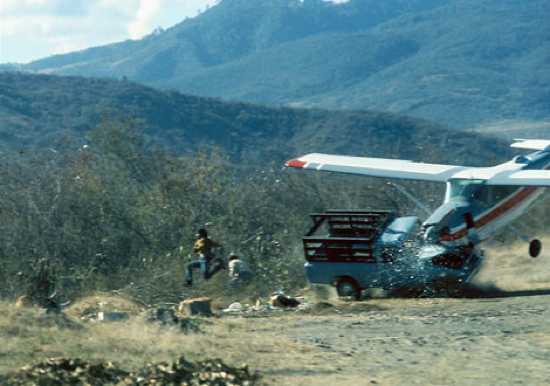 The caption reads: “Buffeted by crosswinds, a rescue plane crashes into a truck, while trying to land on a mountain highway near Sanarate. Miraculously no one suffered serious injury.” Sanarate is the largest city in the El Progreso department of Guatemala. In some organisms, melanism is a usual genetic color variation that has been described as “an increased amount of black or nearly black pigmentation on the skin, feathers, or hair. In humans, melanin is the primary determinant of skin color. People whose ancestors lived for long periods in the regions of the globe near the equator generally have larger quantities of eumelanin in their skins, making them black. The melanin pigment is one of the most mysterious found in living organisms. 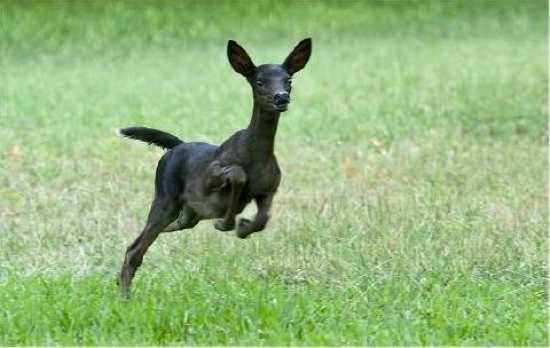 In 2010, images of a rare melanistic black fawn surfaced on the website of photographer Richard Buquoi, who specializes in nature photography. Buquoi captured the pictures near Austin, Texas. 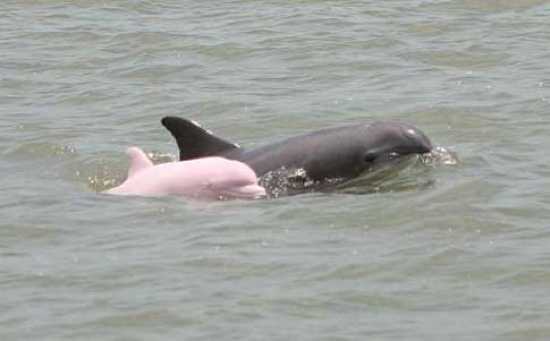 In June 2007, pictures of a pink albino bottlenose dolphin were captured in Calcasieu Lake, which is a brackish lake located in southwest Louisiana, United States. The pictures were taken by Captain Erik Rue of the Calcasieu Charter Service. According to marine biologist Dagmar Fertl, the event was only the third reported sighting of an albino bottlenose dolphin in the Gulf of Mexico and the fourteenth spotted anywhere in the world. Kurt Wenner is an artist with an international following. 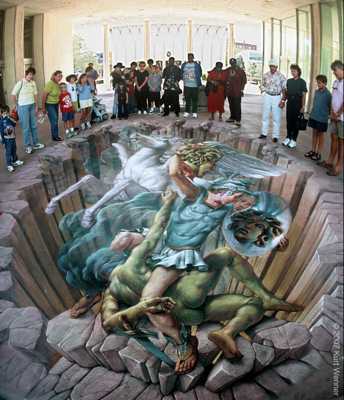 He is best known for his invention of 3D pavement art. At a young age, Wenner worked for NASA as an advanced scientific illustrator. He created conceptual paintings of future space projects and extraterrestrial landscapes. In the 1980’s Wenner first introduced 3D pavement art at the Santa Barbara Museum of Art. He invented a new geometry in order to visualize his work. Over the years, Wenner has become internationally recognized and travels the world to work for high profile clients. The expansion of the Internet has helped Wenner’s popularity and many of his portraits have gone viral. In 2000, the United States suffered a horrible fire season. By the month of August, over 4 million acres of land had been burned. On August 6, 2000, several fires converged in Bitterroot National Forest near the town of Sula in western Montana. As the blaze spread, fire behavior analyst John McColgan captured a remarkable photograph of the scene. 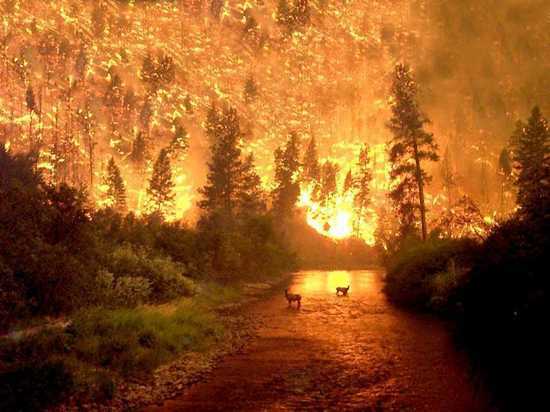 The image shows a collection of deer watching the blaze from a river. In 2000, the photograph went viral and continues to symbolize the loss felt from the fires. 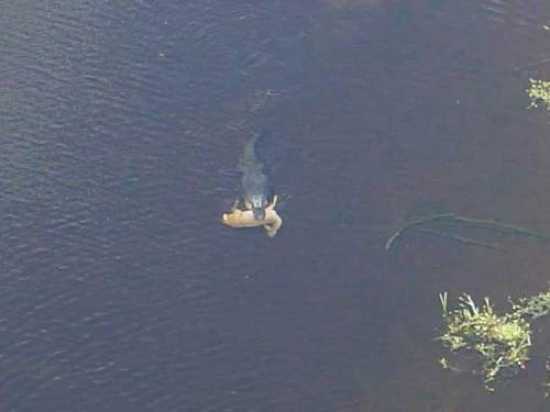 In 2005, the Australian news outlet ABC Far North Queensland reported on a picture that shows a large olive python pulling a wallaby from the water. In 2007, the image went viral under the description that the snake was eating a cow, which is false. The olive python is Australia’s second largest snake species and they have been known to consume large animals. The snake in the photo is enormous and if you look closely it extends all the way off the right side of the picture. It is difficult to see the entire snake because it is so well camouflaged in the rock face. 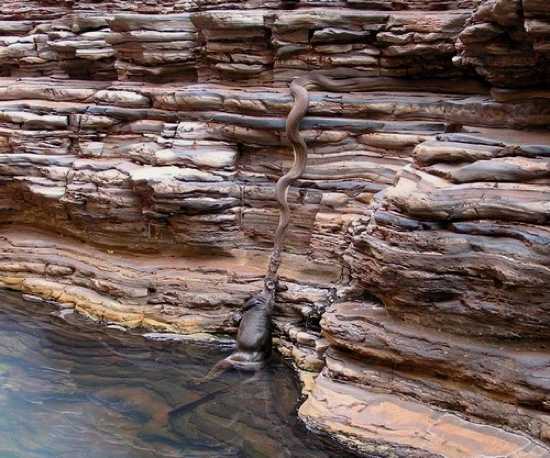 The picture was taken in the Kimberley region of Western Australia. In February 2006, a collection of articles appeared in a variety of UK newspapers that told the story of a set of mixed race fraternal twin girls. In 2005, the girls were born to Kylie and Remi Horder. Kylie and Remi are also of mixed race and have a white mother and black father. The case was extremely rare as the twins were fathered by the same man. Most similar occurrences involve twins from two separate men. The Daily Mail wrote that the odds of the couple producing a set of mixed race fraternal twins are about a million to one. In 2009, cameraman Marco Queral captured some incredible photographs while diving with a 50 ft (15.25 m) female humpback whale in the South Pacific (near Hawaii). Queral has spent 20 years of his life photographing whales. 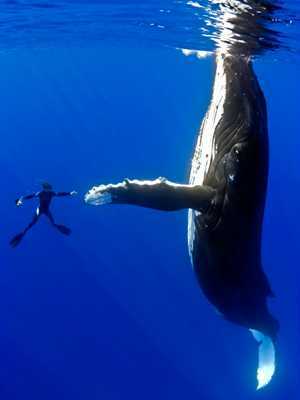 He says they are “extremely intelligent, just like humans, they have their own mind and come with strong personalities.” The most famous image from the collection shows Marco Queral reaching out to make contact with the giant whale. It was taken by one of Queral’s diving partners and went viral in 2009. The image has been spread around the Internet with a story that details an encounter between a whale and a group of fisherman near the Farallon Islands, which is 18 miles off the coast of San Francisco. In the story, a whale became stuck in a collection of crab pots, so the fishermen jumped into the water and cut the animal free. After it was safe, the whale returned to the men to thank them with a nose bump. The man who cut the rope out of the whale’s mouth said that the creature’s eyes were following him the whole time and he will never be the same. The news story is accurate, but it has been falsely attributed to the Marco Queral photograph. In September 2005, Africa Geographic magazine published an article titled Shark Detectives, which examined great white sharks off the coast of South Africa. The article included a collection of photographs that show a kayaker’s experience with a great white shark. 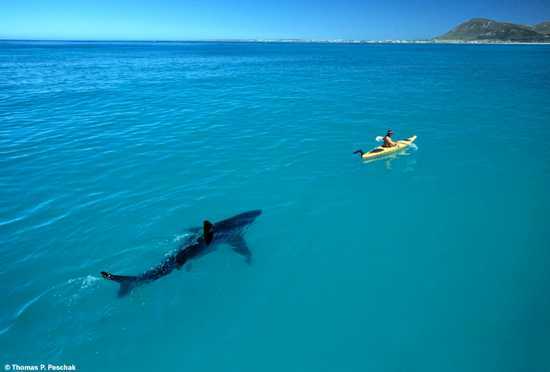 The caption for the photo reads: “Sitting in a 3.8 meter (12.5 foot) kayak and watching a 4 meter (13.1 foot) great white shark approach.” In the publication, the researchers described the tense situation. However, they had already tested the shark’s reaction to an empty kayak and observed no signs of aggression. Over the years, a large collection of fake shark images have become viral over the Internet. Some good examples include the picture of a shark jumping out of the water at a military helicopter, the image of a hungry shark lurking behind divers, the photo of a large shark near a surfer (which is actually a dolphin), and more recently the picture of a shark in the streets of Puerto Rico after Hurricane Irene. In the Puerto Rico image, the shark was pulled from the kayaker photo.